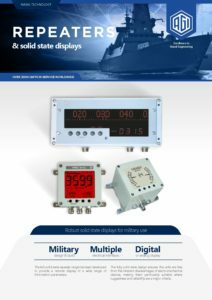 AGI’s range of repeaters for naval applications include Solid State Displays for Navigation and Meteorological data. Available in dedicated single function or multi function colour types. 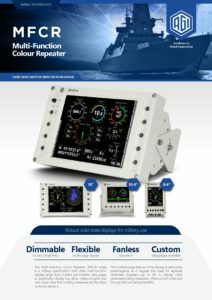 The Multi Function Colour Repeater (MFCR) provides a high-resolution colour display suitable for complex graphics data, with designs available for both military and civil applications. 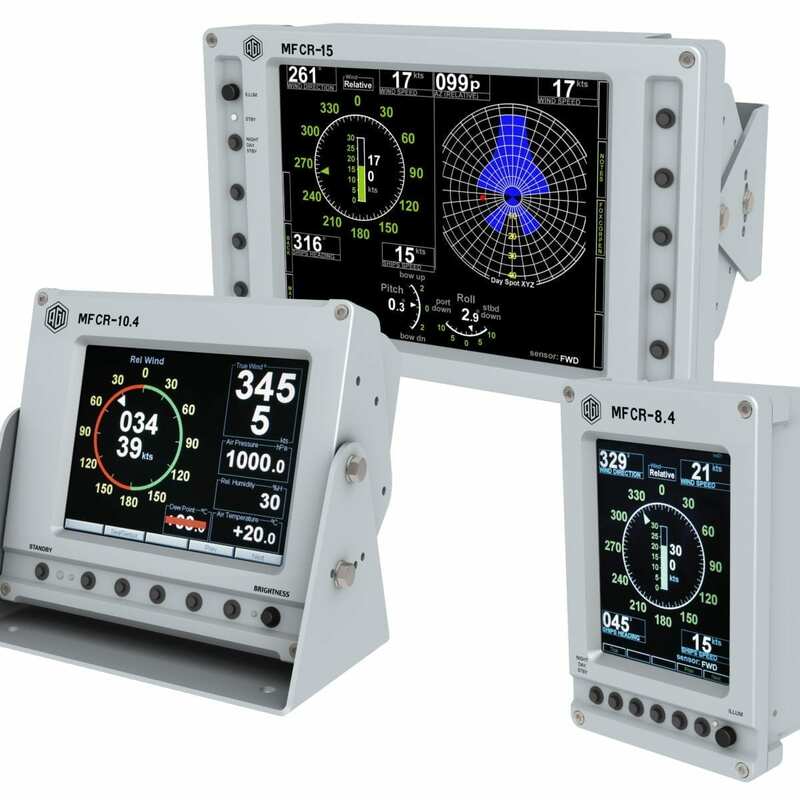 Available in 8.4, 10.4 or 15 inch industry standard sizes, the MFCR incorporates a built-in processor to process and display many navigation and meteorological parameters. The units are configurable during installation with either a fixed single page of data or multiple pages, thus providing initial as well as through-life cost savings. This flexibility allows a common repeater to fulfil different roles at different positions on board ship or other vehicle. A single MFCR is able to replace up to 20 traditional dedicated repeaters, leading to major cost and space savings. A large range of standard navigation and meteorological pages are available from AGI, a customisation service is also available where pages may be designed with customer input to meet a particular bespoke requirement. The AGI monochrome LCD repeaters have a fixed single page design available to display a variety of parameters including Ship’s Speed & Distance, Roll, Pitch, Heel, Trim, Heading, Depth, Wind Speed & Direction, Temperature, Humidity and Pressure. The units are designed and manufactured to military standards using a high degree of common parts, therefore minimising the spares requirements. The displays are configured to suit the particular application by adjustment of firmware and the addition of alternative printed scales where necessary. In most cases the data may be displayed in either digital only or both analogue and digital formats. Analogue providing ‘at a glance’ trend information and digital providing precise information. Each display uses high reliability transflective liquid crystal displays (LCD) with fully dimmable backlighting, ensuring maximum readability in a wide range of ambient conditions. The Submarine Bridge Repeater is a fixed repeater installation capable of withstanding extreme pressures, so can be left permanently in the submarine conning tower. The internal LCD repeater can be modified to accept and display up to 3 parameters in digital format plus 1 analogue display across the top of the display. The unit consists of a modified AGI LCD Repeater mounted in a robust stainless steel housing. The front window is approximately 12mm thick and is made from toughened soda lime glass. The AGI Tape Heading Repeater is based on the moving tape principle. A large format array of Light Emitting Diodes (LED) is used to simulate a moving compass card image past a fixed pointer. This type of display with over 1500 pixels provides excellent rate of change data to the user in a clear unambiguous format. The display also includes a separate digital representation of the data, using 4 seven-segment characters. Features of the Tape Heading Repeater include audible rate of turn, dual gyro input and zoom facility. A master/slave repeater can be used to minimise system cost on platforms which have synchro heading data. Both master and slave repeaters have a dual input capability for interfacing to one or two separate sources of gyro data.